Vantaggio HR Hawai`i celebrated the 10th anniversary of their operations in Hawai`i with a Hawaiian blessing of their new virtual office performed by Kahu Silva. The event in Honolulu brought together VantaggioHR Hawaiiʻs mainland fellow consultants, staff members, business partners and supporters. Kahu Silva began the ceremonial program with an oli aloha (welcome chant) to greet and honor guests. He shared three `ōlelo no`eau (ancient Hawaiian proverbs) that describe the important qualities defining a traditional Hawaiian ohana (family). Kahu encouraged Vantaggio HR Hawai`i to heed the wisdom of these teachings and embrace each other as members of the HR corporate working family in the Hawaiian spirit of “aloha.” He concluded the blessing with participants united hand-in-hand in a symbolic “lei of aloha” and a pule ho`oku`u (closing prayer). Assisting Kahu Silva were Lauraine Bifulco, Founder, President and Principle Consultant and Cara Heilmann, VP and Sr. Consultant of VantaggioHR Hawai`i. 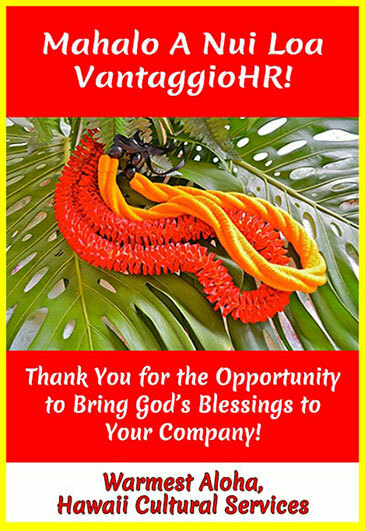 VantaggioHR is a human resource consulting company which provides business-savvy solutions to employers of all sizes, across all industries and fulfills an important role in Hawaii`s virtual business world.